Total Webmail Converter is a professional tool to convert emails from any POP3 account (Yahoo, Gmail) to PDF, TXT, TIFF, DOC, HTML. 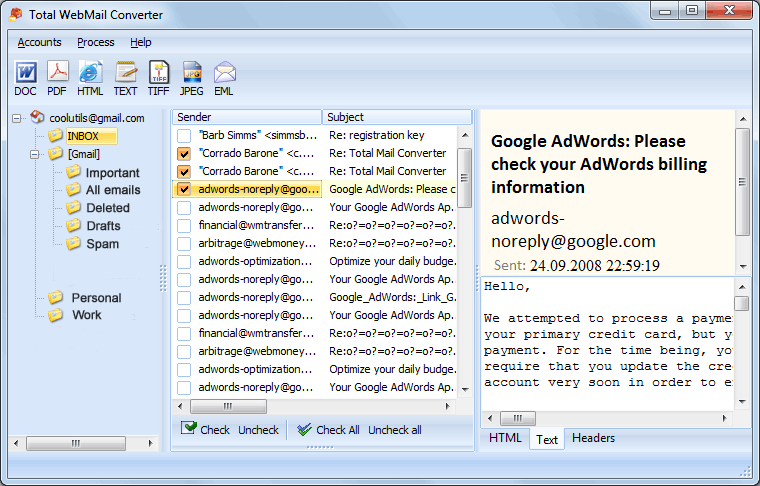 Total Webmail Converter is very flexible. You select the fields that are included into the resulting file (subject, body, sender, recipient, date, etc.) Emails are converted in batch saving your time and effort. Attachments can be placed in a separate folder. Download your trial copy now to learn all the advantages. Scan Direct to Email:Scan your paper document and attach a PDF to a new mail message. Simply place the document in the scanner's sheet feeder, click on the scan button - job done.Adobe Acrobat not required. InboxCleaner is a small utility that connects to your POP mailbox and verifies your e-mail messages. Mail messages that are identified as SPAM are deleted before you download them with your normal mail application.